The numbers certainly don’t make pretty reading for Ben Pearson. 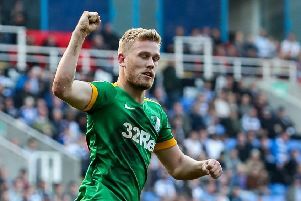 Just over three years since making his Preston North End debut, the combative midfielder has been banned for 18 games in total during his time at Deepdale. Eight of those matches have come this season, the former Manchester United man returning from a second red card of the campaign in the 1-1 draw with Swansea last time out. A key man for Alex Neil without a doubt, the 24-year-old’s regular absences have however begun to divide elements of the PNE fanbase. The man himself insists that while his disciplinary record doesn’t look good on paper, he’s also been booked six times this season, he is learning to watch his step more and more. “One of my red cards this year, against Bolton, was for something I shouldn’t have got involved in,” admitted Pearson, who is likely to anchor the midfield for the game at Queens Park Rangers on Saturday. “The second at Sheffield Wednesday is in my eyes is unfortunate. “In terms of my yellow cards I’ve only been done for dissent once, twice maximum this season. “I don’t think it’s a case of me not learning, I think this season has just been a bit unfortunate for myself. “I’ve got more sendings off which makes it look worse but I think my discipline with referees has been better. Pearson’s red card in the defeat at Hillsborough before Christmas was one that split opinion. PNE’s No.4 was dismissed by referee David Coote just 26 minutes in after diving into a challenge on Marco Matias. While getting plenty of the ball initially, Pearson’s follow through did catch the Portuguese forward just under the knee with the man in the middle swiftly giving him his marching orders on December 22. “At the time I personally didn’t think it was a red card,” said the Lilywhites man. “I can see why the referee has given it but there was no malice in the tackle. “I didn’t even go to tackle him to be honest. “I was just trying to flick the ball to Paul Gallagher which I did. “Then my left leg came up, not intentionally or anything, just with the speed I was running at and the momentum I had it bounced up off the ground.